Gaze upon the emerald waters of Halong Bay, surrounded by towering limestone islands and a lush rainforest. Experience a blend of cultures in Ho Chi Minh City. Discover the natural tranquility of Litchfield National Park. Enjoy delicious food and beautiful views across Darwin Harbour. 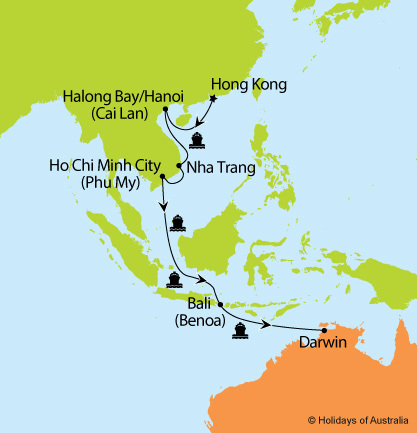 12 nights aboard Sun Princess cruising from Hong Kong to Darwin with port calls in Halong Bay/Hanoi (Cai Lan), Nha Trang, Ho Chi Minh City (Phy My) and Bali (Benoa). Includes on board meals and entertainment. Transfer from the cruise terminal to your accommodation. Includes a half day Darwin City Sights tour with lunch and visit to the RFDS Tourist Facility. 4 night stay in Darwin at the DoubleTree By Hilton Hotel Esplanade Darwin including breakfast. Charles Darwin Sunset Buffet Dinner Cruise including return hotel transfers. Transfer from your accommodation to the airport. Images courtesy of Princess Cruises, Tourism NT, Shaana McNaught, Peter Eve, Darwin Harbour Cruises.